“You’ll never be free until you free yourself from the prison in your mind,” reads the cover … in Braille. As a child Louis Braille (1809-1852) accidentally blinded himself. As a tool for the blind to read and write, he created what’s now known as Braille, providing the alphabet, numbers, and punctuation marks. Each letter/number is read using various raised dots each on a 2×3 grid, which was small enough for a finger tip to read as it passes over the embossing. Just below the Braille on the cover are eyeglasses as portals with prison bars across the lenses with a disconcerting forest scene—free of animals—where one might expect to see eyes. The glasses’ shape matches Nathan Leopold’s glasses which were used to help solve “The Crime of the Century,” the killing of Bobby Franks by Leopold & Loeb, in May 1924 Chicago. The crossed prison bars could also be the image reflected in mirrored sunglasses, like what a blind person might wear. 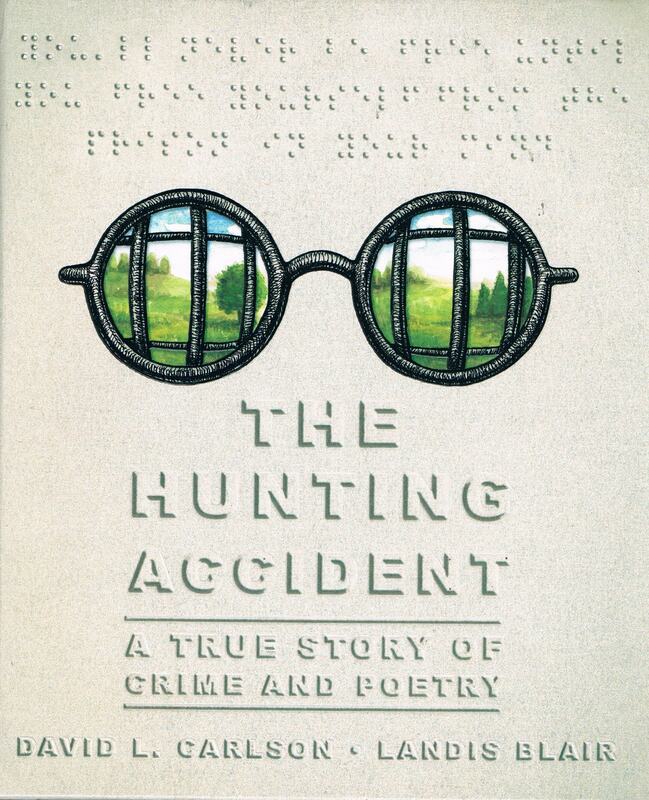 And the reader hasn’t yet opened The Hunting Accident: A True Story of Crime and Poetry by David L. Carlson and Landis Blair. The graphic work is a perfect mix of words and images, telling the story of a father and son, an important part of Chicago’s history, and how they’re connected. I highly recommend this wonderful work. The story opens on a winter day in Chicago 1959, where a child with his suitcase meets a blind man with his service dog, Captain. The child, age 10, is Charlie Rizzo meeting to live with his father, Matt, after a separation of six years and the death of his mother. The first flashback occurs through the exhaust of the bus they’re riding in. Matt tells Charlie the story of his blindness from a hunting accident. Matt took his father’s shotgun to go hunting with his two friends, Enzo and Messina, along the railroad tracks near a forest. Along the way Enzo believes he’s found the drainage pipe where Bobby Franks’ body was stuffed after being killed by Richard Loeb and Nathan Leopold. “In 1925, Leopold and Loeb were the bogeymen of every young boy’s nightmares;” drawn as dark-smoke unadorned, blank white-eyed creatures. The boys think they hear a deer in the woods and Messina wants to have the others flush it out so he can shoot it. In a shocking two page spread, Messina misses and blinds Matt Rizzo with the bogeymen appearing to cover Matt’s eyes as if being stuffed in the drainage pipe. Charlie says, “Wow! How come mom would never tell me that story?” Charlie’s maternal grandmother had always told Charlie that his father’s stories weren’t true. The reader and Charlie will later learn this story wasn’t how events unfolded in at least two ways. Matt Rizzo made his money from being an insurance agent, but his passion was literature and poetry. Matt had a Braille typewriter where he typed his “writings,” which appear interspersed throughout The Hunting Accident. These writings are passed by Charlie to a transcriptionist who sends them back for Charlie to read to his father for editing changes. After any revisions are made, these poetic works are then sent to various academic institutions or journals to see if they will be published. Rejection slips pile up. Charlie learns how to live with a blind person including putting whatever he moves back in its place so his father can find it, doing shopping errands, hearing a clock that chimes out the hours, and seeing that the lights had been kept off when his father was alone in his apartment. His father would often face and stand within inches of a wall because it comforted him that he knew what was in front of him while it made Charlie uncomfortable. Charlie, as narrator, indicates “The apartment was like a prison cell;” it’s dingy with dirty walls. There’s a satchel-briefcase that sits on a shelf that Charlie’s father says he should never look in; and Matt puts it out of reach and it’s quickly forgotten. Matt smokes which becomes the visual entry into additional flashbacks. Charlie’s long time friends are Garza and Dominic. At age 18 Charlie receives his survivor Social Security benefit—his only inheritance from his mother—that his father had been accumulating. He uses it to buy a car. Garza wants to benefit from having wheels available. As a teenager Dominic works at O’Hare airport as a parking valet. This job gives him access to keys of people who will be out of town for a while. Garza decides that would be a good way to steal from the travelers while they’re away. Charlie nervously is the driver while Garza and Dominic steal a TV and other goods from the out-of-town traveler. But this first heist goes wrong when a neighbor sees them take the goods and writes down the license plate and calls the police after they made their escape. Charlie’s cousin, Bob a police officer, comes to Rizzo’s apartment. Matt Rizzo, ironically, had kept his son blind from the true criminal story of his past. Charlie is finally allowed to get the satchel and see the news articles, letters and life history of his father. Through his father’s cigarette smoke we learn the true tale of the “hunting accident” and The Hunting Accident moves through the long tale of Matt Rizzo’s life and some of Chicago’s sordid history. Matt was actually blinded from a gunshot by a liquor store owner who killed Messina when they tried to rip off his store; while a person named Bird waited for them in the getaway car. Matt is incarcerated in Statesville Prison Joliet Illinois in 1936; arriving the day Richard Loeb was murdered in a shower there. At Rizzo’s entry into prison, the reader sees the prison cell bars reflected in his glasses in black and white without the forest scene that appears on The Hunting Accident’s cover. Rizzo becomes the cell mate of Nathan Leopold. Leopold, a polyglot knowing many langauages, learns Braille to teach Rizzo; and so Leopold himself can continue reading after lights out. The graphic work has a long tale over many chapters of Rizzo feeling like he has no future and wants to die. Leopold and Rizzo make a deal for Rizzo to at least read Dante’s Inferno before doing anything extreme. They decide to perform, as a shadow play with Rizzo as narrator, the nine circles of Dante’s hell for the other prisoners by using real prison examples for each circle of hell. Serendipitously, Statesville has a panopticon design, “an idea by the philosopher Jeremy Bentham that you could build into the architecture the power structures of a society so all the cells face a single guard tower in the center [and] his idea was that the prisoner has the sense of always being watched” with nine floors of cells. That is, the prison has a circular design with a guard tower in the middle. Rather than give too much more away, I would like to invite the reader to see how Dante’s Inferno is performed and whether Charlie and his father resolve their criminal histories by seeing for yourself how The Hunting Accident with its wonderful coordination of words and beautiful images plays out. The Newberry Library in Chicago, also with a circular design, is where Matt Rizzo’s writings are stored.